At the edge of a PortMiami wharf where the Seaboard Ocean docked on a recent afternoon, boilers, PVC pipe, pickup trucks, earth-moving equipment and even modular buildings are staged and ready to be lifted aboard for a trip to the Eastern Caribbean. A little farther along the wharf, the Seaboard Atlantic, which is preparing for a seven-day rotation that will take it to Honduras and Guatemala, is waiting to load containers, chassis, boilers and telephone poles. Although the port has topped the million-TEU mark for the past three years, it is poised to break the record of 1.054 million TEUs set in 2005. The county invested $1.3 billion in port improvements, including building a port tunnel, installing Neopanamax cranes, and widening and deepening its shipping channel to handle the bigger ships that began transiting an expanded Panama Canal in the summer of 2016. “We’ve probably had 250 ships alongside over the past 2½ years that we couldn’t have worked without the bigger cranes,” Port Director Juan Kuryla said. Latin America and the Caribbean, with 332,966 TEUs of cargo, accounted for 46% of the port’s total trade in fiscal 2017, followed by Asia with 36% of the traffic. But Asia led the way when it came to imports , snaring 49% of that trade, compared with 29% for Latin America and the Caribbean. Despite the uncertainty over the future of NAFTA, Kuryla is bullish on Mexico as a trading partner. “I’m not terribly concerned. I imagine at the end there will be good deals for all three parties [in NAFTA],” he said. But he would like the free trade deal among Mexico, Canada and the United States to endure. “I’m a believer in free trade,” Kuryla said. “We’re focusing on Mexico because it already has a large consumer market with the means to buy and plants that can export,” Kuryla said. Last year, beer made from malt and glazed ceramic tiles were the two largest product categories in the port’s trade with Mexico. If NAFTA were to blow up, Kuryla says the port still has strong markets in Asia, South America and Europe to compensate. Perishable food from the Caribbean, western South America, and Central America accounts for a large share of imports at the port. Last November, Seaboard Marine, the port’s largest container shipper, delivered its first shipment of dragon fruit from Ecuador to the Miami market. Melons, bananas and plantains, papayas, beans, avocados, guavas, mangoes, asparagus, shrimp, orange juice and pineapples also rank high on the list of regional exports to the port. Besides Mexico, Kuryla expects Colombia, Peru, Ecuador, the Dominican Republic, Jamaica and Chile to be among the best markets in the Americas for the port this year. Argentina, he said, is showing some positive signs with a more open commercial policy from the Macri government. Last September, he traveled to Lima to pitch Peruvian exporters on shipping their asparagus, grapes and blueberries through PortMiami. “Perishables are great business,” Kuryla said. “They are high value and high maintenance.” That means they are also high-profit cargo. Later this month, a new ZIM line CFX service running a weekly Kingston-Miami-Halifax-Kingston route will begin. “Venezuela I don’t think can get any worse,” Kuryla said. “When I came to the port in 1998, over 20% of Seaboard’s business was with Venezuela. Now it’s nothing.” He said there currently is no service from PortMiami to any Venezuelan port. That’s also true of Brazil, where there has been no direct service from Miami for the past six or seven years, Kuryla said. But he added: “We haven’t lost hope of having direct service to Brazil.” He’s been talking to shipping lines that currently call on Brazilian ports, trying to pitch them on the idea that the large consumer market located right here in South Florida would make Miami a worthwhile port of call. “I think by the summer of next year we will have service to and from Brazil,” Kuryla said. In contrast, Brazil is Miami International Airport’s top trading partner. 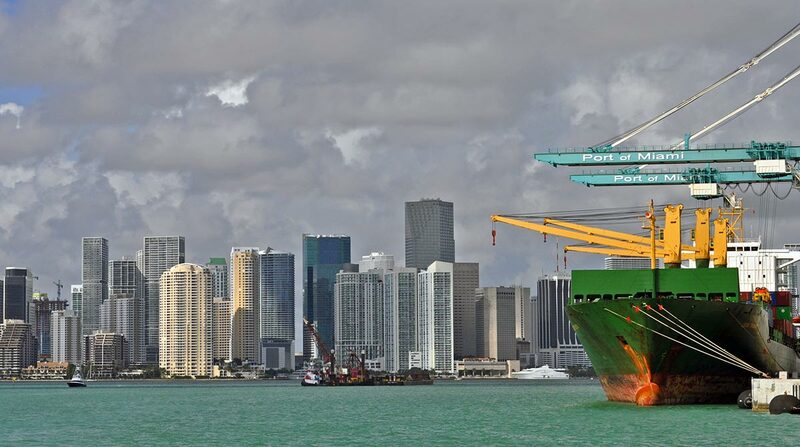 Through March of this year, MIA’s trade with Brazil totaled $3.36 billion, easily eclipsing runners-up Colombia ($1.1 billion) and China ($1.05 billion), according to an analysis of U.S. Census data by WorldCity, a Coral Gables media and data services company. Higher value, less bulky merchandise tends to move by air. While the dollar value of trade is one yardstick that can be used to measure trade volumes, it can be skewed if the trade mix includes very high-priced products such as aircraft and aircraft parts, or commodities such as gold that are subject to wide price fluctuations. The top export at MIA through March was aircraft/aircraft parts at $1.86 billion. Gold, which is imported from Latin America and then exported from Miami to Switzerland and the Middle East, ranks third on both the export and imports lists, according to the WorldCity analysis. Total trade at MIA was up 4.8% to $15.61 billion during the first quarter of this year. Total trade at the seaport, using the dollar yardstick, was up 6.91% and totaled $6.26 billion during the first quarter. Total trade reached $24.07 billion for all of 2017. The No. 1 export product so far this year at PortMiami has been passenger vehicles ($87.94 million), and the top import category was knitted and crocheted sweaters, pullovers and vests ($225.78 million), according to WorldCity.